The next volume of Pantheon will center on the artifact known as Pandora’s Box (or Jar), but in order to render the mythology properly, we need to assess its significance first. 71. HOPE. – Pandora brought the box of ills and opened it. It was the gift of the gods to men, outwardly a beautiful and seductive gift, and called the Casket of Happiness. Out of it flew all the evils, living winged creatures, thence they now circulate and do men injury day and night. One single evil had not yet escaped from the box, and by the will of Zeus Pandora closed the lid and it remained within. Now for ever man has the casket of happiness in his house and thinks he holds a great treasure; it is at his disposal, he stretches out his hand for it whenever he desires; for he does not know the box which Pandora brought was the casket of evil, and he believes the ill which remains within to be the greatest blessing, it is hope. Zeus did not wish man, however much he might be tormented by the other evils, to fling away his life, but to go on letting himself be tormented again and again. Therefore he gives Man hope,- in reality it is the worst of all evils, because it prolongs the torments of Man. This is a rather bleak view, one that chimes perfectly with his interpretation of the Hellenic Greeks as natural, even cheerful, pessimists. 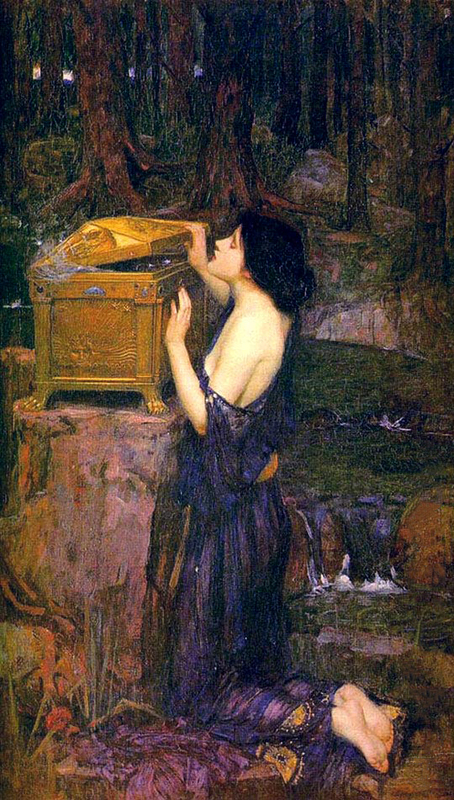 Since Pantheon is a work of fiction, we can resolve this dilemma with a convenient explanation: Pandora’s Box is an Edenic artifact that can either edify or condemn a terrestrial species. Moreover, the members of team Pantheon must figure out how to unlock this artifact, because it is not a creation of the gods.